Join LMU students, faculty, and staff as we welcome author, educator, and interfaith leader Eboo Patel to talk about his book Sacred Ground: Pluralism, Prejudice, and the Promise of America. This event is free and open to everyone in the LMU community. Sacred Ground is the 2018 LMU Common Book. This is event is part of LMU's First Amendment Week programming, supported by the Los Angeles Loyolan and ASLMU. 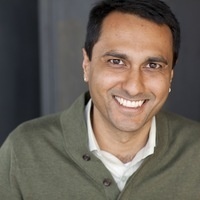 Eboo Patel is a leading voice in the movement for interfaith cooperation and the Founder and President of Interfaith Youth Core (IFYC), a national nonprofit working to make interfaith cooperation a social norm. He is the author of Acts of Faith, Sacred Ground, Interfaith Leadership and Out of Many Faiths. Named by US News & World Report as one of America’s Best Leaders of 2009, Eboo served on President Obama’s Inaugural Faith Council. He is a regular contributor to the public conversation around religion in America and a frequent speaker on the topic of religious pluralism. He holds a doctorate in the sociology of religion from Oxford University, where he studied on a Rhodes scholarship. For over fifteen years, Eboo has worked with governments, social sector organizations, and college and university campuses to help realize a future where religion is a bridge of cooperation rather than a barrier of division.